Today I will reflect back to 2001 the year Greg Winslow and I paid tribute to a true mountain man and legend, Tom “Silver Fox Addison”. 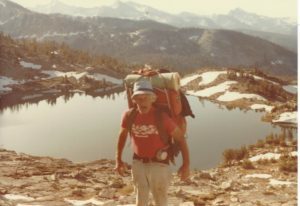 Tom had dedicated almost 50 years hiking our Sierra Nevada Mountains. He was like many of us; his weakness was forgetting to place his accomplishments on pen and paper. Now all that is remaining of his adventures today are from those who knew him and shared his past memories on those wilderness trails. 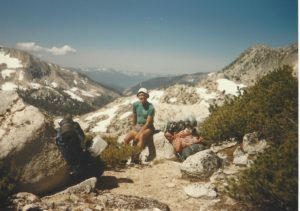 One story I would like to share with you was when Tom was in his 60’s he decided on a solo adventure from the east side and end on the west side of our Sierra Nevada Mountains. The starting point was Bishop on the east side to Mono Hot Springs on the west side. This adventure started sometime around the beginning of March with the winter snowpack at its peak. Cross-country skis and snowshoes were part of his gear. His food cash was placed along the route. I’m not sure but maybe the forest service may have dropped his provisions by aircraft. The Forest Service knew his route and twice they spotted him forging through the snow. He acknowledged their presence and waved indicating he was okay. After arriving at Mono Hot Spring, he took a few days to rest and started the return trip back to Bishop on the east side. Tom stated; the return trip was much more difficult because 30 days earlier those frozen streams were easy to cross. On the return trip, snow was melting and those gentle streams are now swift moving currents. Tom shared this story over a campfire with me sometime during 1985. 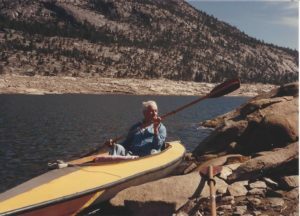 I’ll share with you two more separate adventures; at the age of 84, he accomplished two solo hikes, one to his favorite fishing spot Peter Pande Lake. Second, he climbed Mount Whitney during that same season. In 1996 Tom passed away at the age of 86. In 2001 Greg and I agreed to place a sign on his favorite pass which was located above the Graveyard Lakes. There are no trails over this pass, one just picks an expectable route and follows to the summit. Tom loved fishing and his favorite lakes were Peter Pande, Olive and Ann Lakes located east of this pass. Those of us who knew Tom accepted and continue calling this saddle; The Silver Fox Pass in his memory. With Tom’s sign strapped to my backpack and with Greg carrying the necessary hardware we started our adventure to Silver Fox Pass and beyond. We departed from the northwest trailhead at Edison Lake. Our first campsite was one of the lower Graveyard lakes. This first day seemed endless from the added weight of this sign. Finally, we arrived at the lower Graveyard Lake. What a relief to remove my heavy backpack. The following morning we hiked past the remaining four lakes and started our climb to the Silver Fox Pass. Once reaching the pass at 10,800 feet, behind us at the lower elevation was this incredible view of the five Graveyard Lakes and forest we hiked through the previous day. The pass itself boasted the only tree cover at this elevation. Surrounding the pass were steep cliffs and deep canyons to add to its personality. This pass is on the Silver Divide which host peaks from 11,247 feet to the tallest peak Mount Isaac Walton at 12,099 feet. We mounted his sign and placed his favorite orange color drinking cup below the sign. Ironically my first hike with Tom was over this same pass back in August of 1982. Before starting our descent on the opposite side Greg called out to me; over here and look what I discovered! Located on the west corner next to a steep drop-off was this huge flat boulder. Lying on its surface were numerous obsidian chips clustered in small piles. Normally at this time of year, two feet of snow cover the pass. The previous winter snowfall was light so this boulder is now exposed. Looks like our American Indians discovered this pass hundreds of years before our arrival. We offered our final respects to the Silver Fox and gave consideration to the flat boulder displaying the obsidian chips, we left them undisturbed. We continued down from the pass and hiked to our second campsite at Wilber May Lake. We were looking forward to a couple of days fishing, but less than an hour after arrival we heard a large rumble. My first thoughts were of a low-flying aircraft. Within seconds tumbling down the mountain on the opposite end of the lake, a huge boulder the size of an automobile splashed into its surface. I was told that an earthquake or any large object creating a disturbance in any small lake, the fish will not bite. Our two days of fishing was a bust! All we ate was freeze-dried food, no fresh trout! During this five day trek, we visited Peter Pandi, Grassy, Papoose, Chief, Silver Pass Lake and Lake of the Lone Indian. Next, we’ll follow the John Muir Trail back to Edison Lake and ride the fiery across to Edison Lake Vermilion and home. Personally, this jester was the least I could do in respect to the man who introduced me to the mysteries of our Sierra Nevada Mountains.